Cast of Rhinoceros. Photography by Mihaela Bodlovic. There often comes a point in allegorical pieces of theatre where an audience may understandably begin to tune out – the moment where they ‘get it’. Perhaps the thinly veiled stand-ins for real-world issues and figures wears tiresome, or the existential point of the play itself has simply been repeated ad nauseam. 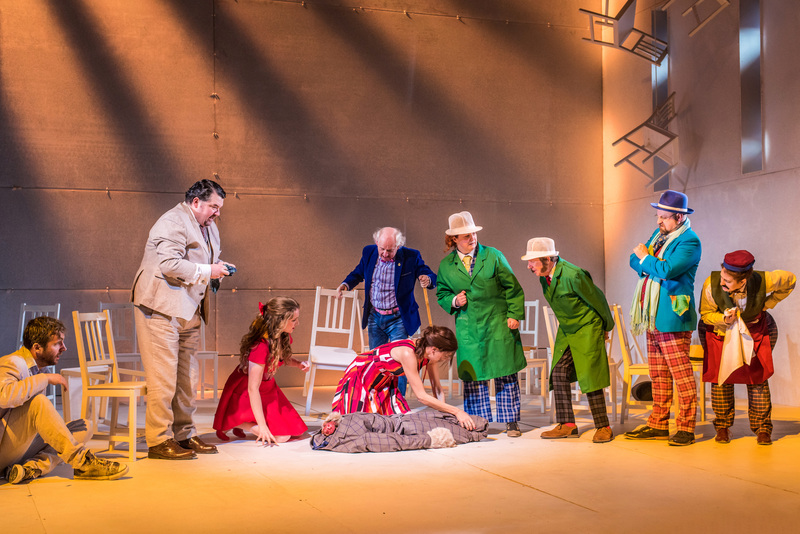 To the immense credit of director Murat Daltaban, adaptor Zinnie Harris, sound designer Oğuz Kaplangi, and the entire cast of The Lyceum’s staging of Eugene Ionesco’s absurd masterpiece Rhinoceros, during this production, that moment never comes. Instead, this 96-minute masterpiece enraptures the audience at breakneck pace from start to finish, as it follows a quiet provincial town through a terribly sudden series of disastrous encounters with immense rhinoceroses who seem to come out of nowhere. As the townspeople begin to realise that their own citizens are transforming into the rhinoceroses around them, the remaining human beings react with a mixture of confusion, anguish, and disbelief, which all-too-quickly melts into skepticism, complacency, and inaction. Just motley, disheveled protagonist Berenger (an electric Robert Jack) seems to react with sheer panic and disgust for the beasts, and angles to figure out what to do, only to be talked over and ignored by everyone else. 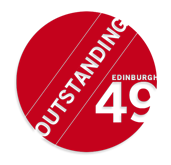 On the subject matter, one can understand why Zinnie Harris’ adaptation of Ionesco’s hot-blooded anti-fascist play won over audiences at the Edinburgh International Festival this past year with its infuriating banality. The choice to follow Orson Welles’ example (when he directed the first English production of Rhinoceros at the Royal Court in 1960) and relocate the action from France, the original setting, to pseudo-modern Britain — possibly even Scotland…possibly even Edinburgh — is a commendable one, as the calamitous loss of reason and morality among society feels all too believable when delivered with accents as local as these. Even since its 2017 festival debut, the play has gained even more harrowing relevance, considering the looming deadline for Britain’s inflammatory exit from the European Union and the unimaginable complacency on display inside the Republican-led US government to its own all-American brand of authoritarianism. Harry Ward’s pitch-perfect and side-splitting rendition of The Logician’s “re-contextualizing” of the most pedantic and existential elements of the rhinoceros question, (instead of just focusing on what to do about it), is all too familiar, and a clever jab that lands brilliantly. The play is full of commendably measured performances, including standout bone-headedness from Sally Reid as Botard and Myra McFadyen as a suspiciously familiar-looking Monsieur Papillon. Esin Harvey, John Cobb, and Natalie Arle-Toyne also turn in hilarious and eye-catching portrayals of variously deluded and theatrical supporting characters. But the real scene-stealer is Steven McNicoll as Jean, the rotund and incorrigible gentleman who bats Berenger around verbally and physically as he opines on the world, almost always in a completely unproductive direction. McNicoll plays Jean with such revolting yet somehow delightful arrogance and verbosity that in the genuinely terrifying sequence where Jean falls victim to the mysterious affliction, it is sad to see him go. Complete loss of humanity, and the structures and pillars upon which ‘decent society’ are meant to rest, are ingeniously realised onstage. The set itself develops alongside the narrative by steadily adding platforms to raise the action higher and higher above the open settings the first scene. With truly nightmarish effect, the playing area for the performers becomes smaller and smaller, and physically farther away from where they began: a ‘rising tide’ of fascism. 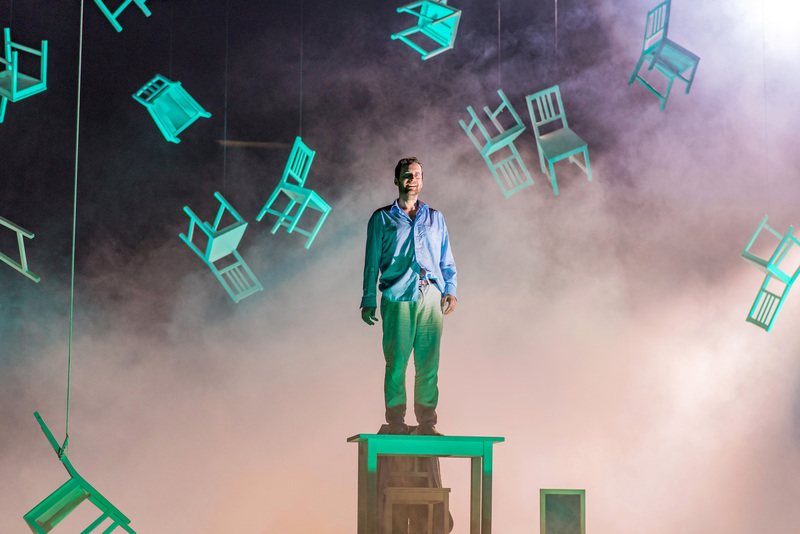 In addition to the set, the impressive stagecraft features delightfully insane costume design by Tom Piper, effective and visually arresting lighting design by Chris Davey (particularly memorable when Jean’s silhouette is portrayed in full during his horrifying transformation into the eponymous beast), and a pitch-perfect soundscape, composed and mostly performed onstage by Oğuz Kaplangi. 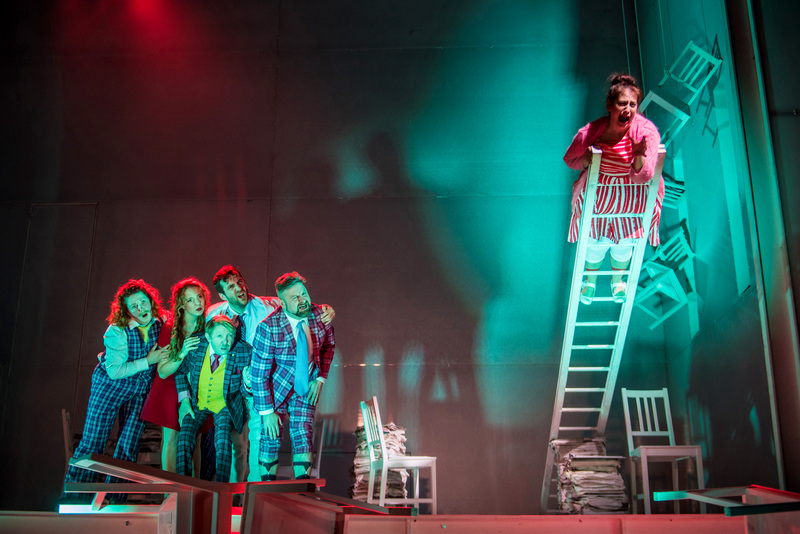 The ingenuity of Kaplangi’s sonic contribution is first introduced as the first rhinoceros stomps by, signified by a cacophonous racket that echoes behind and around the audience, leaving the viewer to fill in the visuals with their mind’s eye to match the might and ferocity that the onstage townspeople are witnessing. The fabulous use of sound and music only improves throughout the play, and it is striking how often the unsettling and masterfully composed soundtrack re-enters so subtly that the viewer might not notice its recurrence until it reaches an intense crescendo. Kaplangi also turns in perhaps the most unexpectedly memorable performance as a local cat, who saunters across the stage at the very opening and introduces the tone of the production perfectly. This production deserves to be seen by a wide and receptive audience, even though it falls victim to some less inspired elements. Harris, has for some reason, inserts repeated opportunities for the onstage performers to interact with the audience and generally poke and prod at the fourth wall. There are references to how hard it is to memorise some of the long words in the script, a direct description of how great the Royal Lyceum Theatre is, and quite a few winks to the audience about how insane the play has gotten. The production is so well-executed in nearly every other regard that the self-deprecation comes off as cheap and unnecessary. There is also a particularly aggravating sequence where Berenger and Dudard, at the peak of the storyline’s mayhem, conduct an entire conversation without looking each other in the eyes; and though this is quickly reframed as a deliberately surreal choice, it is perhaps too distanced from the narrative urgency of the scene. One last note: perhaps this production’s most intriguing effect is the startling realisation that Ionesco’s cautionary tale of a society allowing itself to be consumed by monstrous, unacceptable forces, fits well into rejections of widespread societal change as a whole, both left and right wing. To be clear, Ionesco’s Rhinoceros is unmistakably anti-fascism and anti-fanaticism, and Daltaban pulls no punches about who to reference and ridicule. Yet Berenger’s climactic monologue, alone atop a mountain of crumbled society, announcing that he is the “last white man left,” and remarking on the foreign skin colour of the ubiquitous animals, leaves an oddly white supremacist taste in the mouth. Perhaps Harris and Daltaban, and even Ionesco himself, are intentionally reframing the ‘lone hero’ of Berenger as unreasonably disdainful of the new form of his fellow citizens, or perhaps society today regards Berenger’s self-assumed superiority more skeptically than Ionesco’s 1960 production would have, making what was once a statement of European decency sound more like a nationalist wail. Whether or not you agree, this heavy question serves as yet another reason to head over to The Lyceum for a night of hilarious yet harrowing théâtre de l’absurde. With such a phenomenal combination of cast, crew, sound, visuals, and timeliness, Murat Daltaban’s production of Rhinoceros is not one to miss.